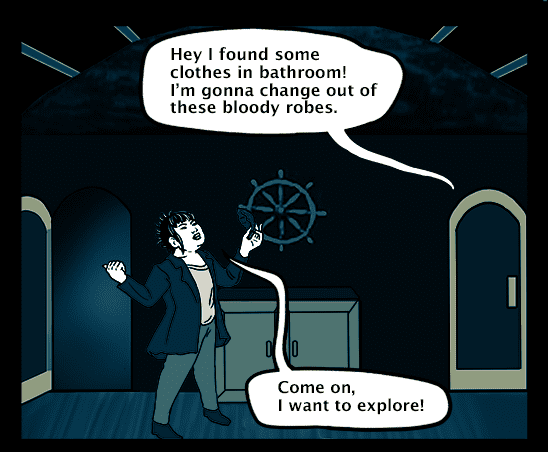 This comic contains minor spoilers for The Voyage, but major plot points have been changed to preserve the mystery. In the game, Farid goes into a bathroom while Emma waits outside. Farid: Hey I found some clothes in the bathroom! I’m gonna change out of these bloody robes. Emma: Come on, I want to explore! Farid and Emma descend to the main deck. Faird is wearing normal clothes. Unconscious bodies are sprawled everywhere. Tash: When you reach the main deck, you see passengers and crew sprawled about, as if they all lay down at once. Emma: They’re not dead, just unconscious. Farid: I can’t see how this could possibly go badly for us. Tash: As you watch, the passengers and crew rise from their slumber and turn on you with murder in their eyes. The unconscious bodies stand up and lurch toward the characters. Emma raises her gun. Farid stops her from shooting. Farid: Wait, you can’t shoot them, maybe they can be cured! Emma: That means it’s time for our most time honored strategy. Emma and Farid turn tail and flee back into the ship. I am curious: why do you have transcripts for your comics? Mostly for folks who depend on text-readers and want to know what happened in the comic. It also makes the comics more searchable, as a bonus.